Classic Framing & Executive Framing. Home of the $229 jersey framing! SportsDisplays is the #1 jersey framing company producing quality framed pieces for thousands of customers every year. We specialize in custom framed jerseys and it shows - our customers consider SportsDisplays framing to be the best! At SportsDisplays we give you Custom Jersey Framing at the most affordable price, including FREE SHIPPING! The most popular jerseys include football (NFL and college), baseball (MLB and college), basketball (NBA and college), and hockey (NHL and college); but we have framed countless items from nearly any sport you can think of - soccer, lacrosse, field hockey, MMA, boxing, softball, volleyball, paintball, motocross, wrestling, rowing, golf, tennis, cycling and more! We've even created custom framed police uniforms, military uniforms, letterman's jackets, corporate T-shirts, you name it! Regardless of the sport or type of project, our loyal customers trust SportsDisplays to create art out of their treasured memorabilia and we take great pride in delivering the highest quality framing available. Now, how much does it cost to frame a jersey? Believe it or not, our Classic Framed Jersey is only $229! And if you're looking for something a bit fancier, the Executive Framed Jersey is only $390! So, why would you take your jersey to a local frame shop or Michael's? Sure, they frame art, or might be able to build a jersey shadowbox, or even sell a jersey framing kit. But framing jerseys is not their specialty! Plus you’ll easily pay $400-$800 at Michaels or your local frame shop despite the fact that the quality isn’t nearly as nice as the SportsDisplays finished product. Professional athletes, executives, and serious collectors all choose SportsDisplays to display their collection because they know: This is what we do, we frame jerseys. No one frames more jerseys. No one frames jerseys at a better price. No one has more raving fans. See for yourself! 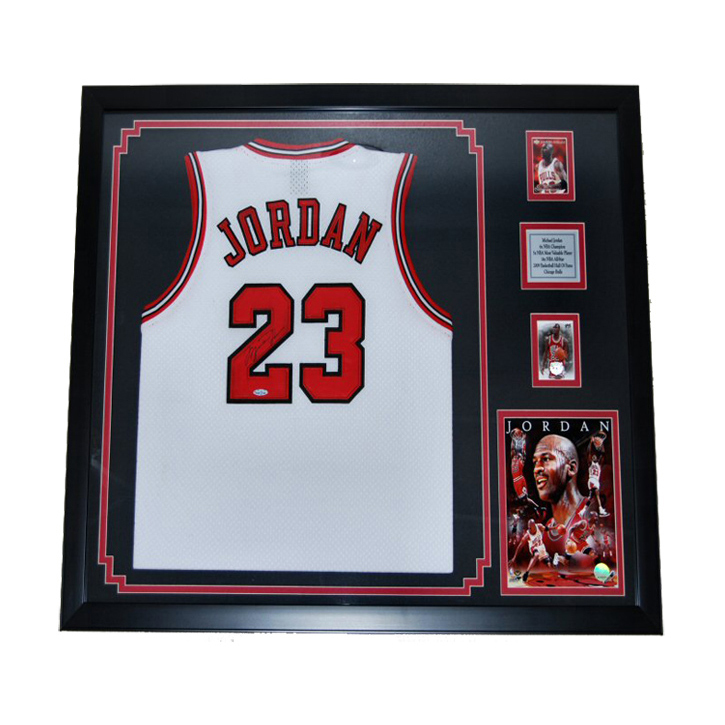 Executive Jersey Framing is the most polished way to frame your jersey. To create a more luxurious look, SportsDisplays uses suede matting matched to the jersey color palette. By cutting the suede to outline the jersey and incorporating the team logos, we're able to highlight the jersey even further. The Executive style of framing is very elegant and hands-down the favorite among professional athletes, serious collectors, and executives.